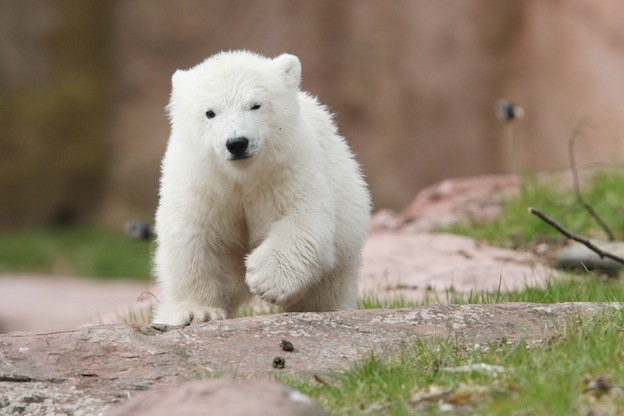 There is a great deal about Polar Bear reproduction that remains a mystery. However, there is enough information that pieces of it can be identified and the rest assumed through educated guesses and materials. They are mainly solitary animals until it is time for the mating process to begin. The males will initiate things by courting females they are interested in. This will occur between April and May each year. The males will compete aggressively with each other for the right to mate with the females. There tends to be plenty of selection as the Polar Bears move towards certain hunting areas for food during those times of the year. Males tend to get one female in their mind to mate with and will fight all others that want to be with her. Some of these males have been known to go more than 100 miles to mate with a female that they have picked up the scent of. These fights among the males for the females can be extremely aggressive. They will fight for hours resulting in torn skin, broken teeth, and plenty of scars for all involved. Older male Polar Bears are often more skilled at fighting and stronger so they will earn the right to mate most of the time over the younger males. If you notice the physical characteristics of Polar Bears, you will see that the males have more fur on their legs than females. Researchers believe that this additional hair is very attractive to the females. It is also believed that it serves as a way for them to decide who they wish to mate with. It is compared to the mane of a lion which is also known to attract females to it for mating purposes. It isn’t uncommon for females to end up mating with more than one male though. DNA testing has proven that a litter of cubs can all be from the same father or from different ones. Generally the mating process with each male will last for a full week which helps to ensure that conception has occurred. In the last decade there has been proof that the Polar Bear occasionally will successfully mate with other the Brown Bear. This has been confirmed by physical characteristics of some offspring as well as DNA testing. It is believed this occurs on a very limited basis though. The females generally gain between 400 and 500 pounds during their pregnancy. She will build a den for her cubs to be born in with a series of chambers in it. Polar Bears give birth to their cubs on land. Once completed, she will hibernate in the den. Only the pregnant females will hibernate, the others are active all year long. What is interesting with Polar Bears is that their body temperature doesn’t drop like that of other bears while they are hibernating. Their heart rate does drop considerable though like that of other bears. The offspring will be born any time from November to February. They only weigh about 2 pounds at birth and are completely dependent upon their mother for survival. Generally there will be two cubs born. The mother will live off her fat reserves as she remains in the den with the cubs and nurses them on milk that contains a great deal of fat. They will weight close to 35 pounds when they all emerge from the den. 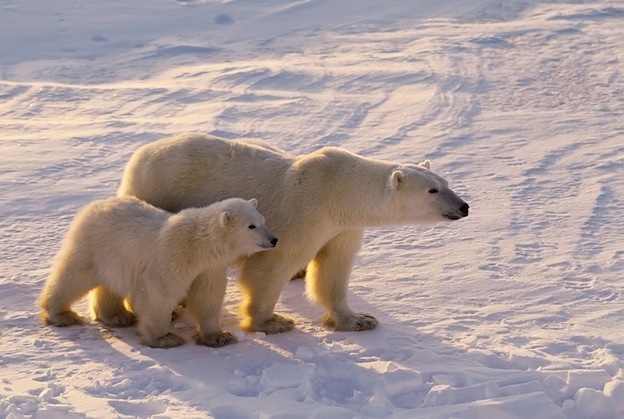 Polar Bear mothers are very affectionate and nurturing towards their offspring. They will continue to nurse them until they are about 2 ½ years of age. Approximately 60% of these cubs die before they are a year old though. This is due to environmental problems, wolves, and even aggressive male Polar Bears that see them as a threat.